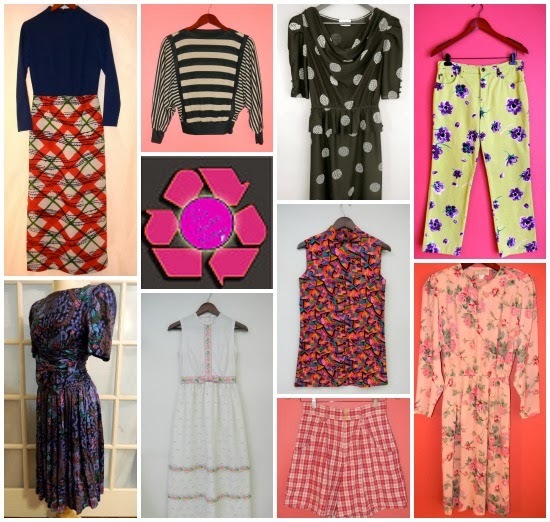 We've already featured Becky and her shop already last year, but Pink Cheetah Vintage deserves a return visit. Becky's always got a fresh crop of colorful and bold vintage items in her shop, and her warmth can be felt from her present digs in Asheville, North Carolina all the way across the interwebs. She's always got a kind word, and a supportive gesture, whether it be her liking something on Facebook, sharing a tweet or commenting on Instagram, Becky is there to cheer you on! So, here's a chance to cheer her back. 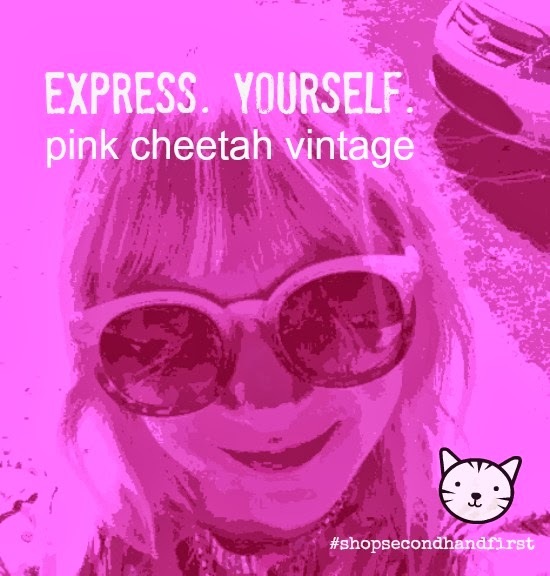 Pink Cheetah Vintage exemplifies the values of shopping SECONDHAND FIRST. Becky's shopping choices that she makes for her family are all about being sustainable and ethical, and she personally looks for secondhand options before she buys anything new. As a small business person, Becky is part of the booming cottage industry that helps keep our economy going, while keeping usable items out of our landfills. As an artist, her eye is keen on colorful and expressive clothing, so when you shop her goods at Pink Cheetah Vintage, you're sure to find plenty of ways to purr-fectly express yourself on the go! You can express yourself over at her Etsy shop: Pink Cheetah Vintage and if you use promo code ROSEBUD between now and March 5th, you can get 10% off your purchase! Be sure to find + follow Pink Cheetah Vintage on Facebook, Instagram and Twitter. Now it's time to share your #SECONDHANDFIRST looks. Please feel free to leave a link to one of your looks featuring a sustainably shopped garment, accessory or item that's been swapped, thrifted shopped or ethically produced + sourced. 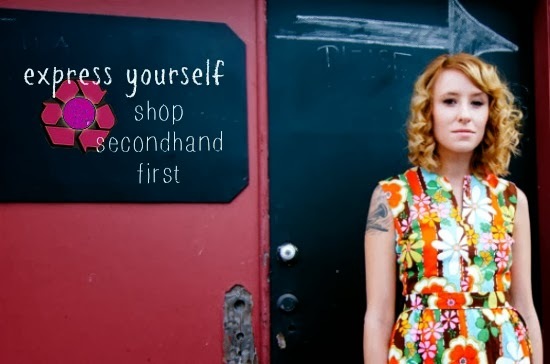 We'll be hosting this first ever SHOP SECONDHAND FIRST event for one week, so you'll have plenty of time to share and be social. Yay! Becky is great and so are you! I didn't know Becky had moved. I miss seeing her blog, but I guess I need to visit her in other ways. Thanks for highlighting her! My link is up. Blouse, blazer, lady-tie and brooch are all second-hand. Thanks so much for hosting, I love this idea! 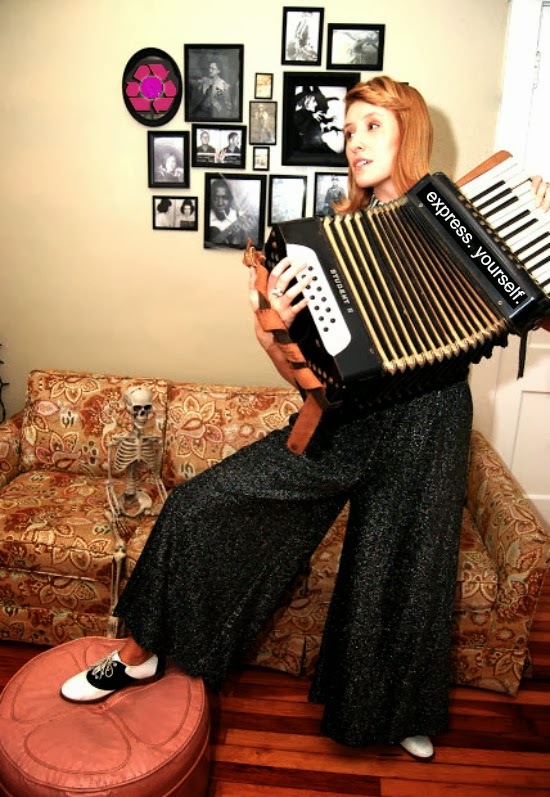 The photo with Becky playing the accordion, wearing those amazing trousers and saddle shoes...and serenading a skeleton is beyond priceless! I love it. I'm linking up today because I have been sewing garments made from fabric pieces purchased at thrift stores! Thanks for hosting!!! Everything I wear is always second hand. I don´t remember when I bought anything new. Thank you for this chance to join. Sounds like an amazing idea to me! I am sharing two posts today, one with two clothing items thrifted at Goodwill, and another post with an accessory (scarf) thrifted at the same Goodwill! Thank you for hosting, Bella!! Such an awesome idea! Linked up and promoting you this weekend. Thanks, Bella! Thank you for the hosting. It's always a pleasure to wear second hand. A beautiful feature! I'm off to check out Becky's site. What a great idea for a link party.. Secondhand first is a value that I hold dear. Thanks for hosting! Everything I was wearing in my post was thrifted. I love thrifting too! Becky is awesome! Great feature, Bella. I'm living in slow motion and was just going to link my last post up here, but I'm too late. GAAA! Anyway, Secondhand First all the way. You said it.